“They handle the Steinway, Chickering and Hardman pianos, and Mason & Hamlin and Taylor & Farley organs, and the reputation of these instruments is so well established they require no commendation at our hands. The Hardman piano Company was established in New York city in 1842 by Hugh Hardman. Hardman pianos soon became known for their fine musical qualities, timeless cabinetry and durability. 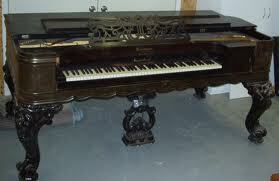 The house of Hardman progressed steadily and at the 1876 Centennial Exposition introduced the Hardman Art pianos. In 1880, Leopold Peck joins Hardman with the primary focus on developing the Hardman piano as a noted performance instrument. In achieving his goal for the Hardman piano Peck spearheaded many innovative design ideas and in 1886 introduced an artistic player piano called the Autotone. This instrument was recognized as a piano of unquestionable excellence and beauty. Picture shown is a turn of the century Hardman Rococo Square Grand piano. Leopold Peck becomes a partner in 1890 and the company is renamed Hardman, Peck & Company. Peck acquires the business in the mid 1890’s and the success of the Hardman piano continues. Upon Leopold’s death in 1904, management of Hardman, Peck & Company passes to his son, Alfred L. Peck. Under continued growth, the firm is incorporated under the laws of the state of New York in 1905, capitalized at $800,000. Carl E. Peck succeeds Alfred L. Peck as company president in 1911. Carl had joined Hardman, Peck & Company in 1890 as production manager. Prior to this he had spent eighteen years in lumber manufacturing in the Black Forest of Germany. By this time the company had retail stores operating in New York and Philadelphia. The artistic superiority of the Hardman piano had found its proper recognition in the music world. Noted institutions chose the Hardman piano as their preferred piano, and for many years Hardman served as the official piano of the Metropolitan Opera Company. Success in the industry did not go unnoticed. The Aeolian Corporation, another distinguished piano manufacturer, showed interest in acquiring Hardman. Having additional resources in manufacturing, finance and capacity the Aeolian Corporation purchases Hardman, Peck & Company. Aeolian expands the Hardman product line, building to the quality expectations of the original company. Today, Hardman, Peck & Company continues to build quality pianos to meet the demands of every pianist. These pianos offer an outstanding value in a complete line of console, studio, professional upright and grand pianos; all which are available in a variety of styles and finishes. Hardman, Peck & Company – quality crafted pianos from the world’s finest materials since 1842.